Providing educational requirement solutions nationally, CPEthink is always up to date on the latest continuing education requirements for certified professional accountants. Maintaining the highest standards, you’ll never miss a credit and maintain soaring results on your professional audits. From technical to HR and ethics, and every finance skill or trade in between--we’ve got a course to meet your needs. Ensure competence with up-to-date curriculum, testing, and certification. 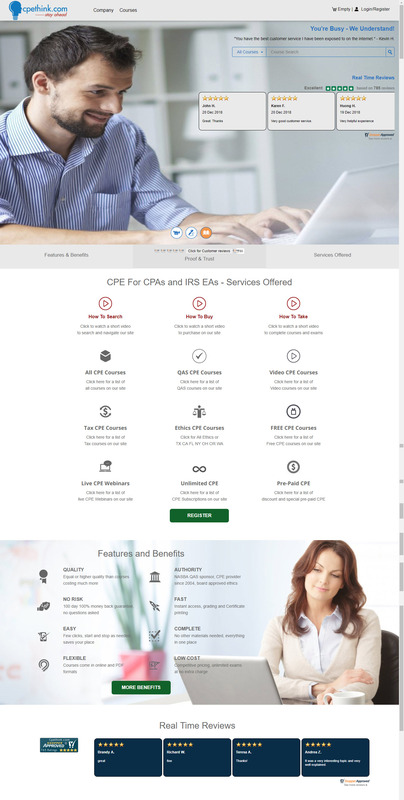 We offer CPE for CPAs in every required area in finance and accounting. Certified by multiple accreditation organizations, our site is qualified to help you maintain obligatory coursework throughout your accounting career. Discover the latest standard of CPA CPE. Enhance your value, maintain certification, provide competitive edge competence, and maintain authority in your field of practice. Our CPA CPE subscriptions and individual courses meet the requirements of every State Board of Accountancy. While each state varies in its mandatory CPA course work, we’ve made sure to make your courses accessible to you no matter which state you’re in. Regardless of where you’re logging in from, the required amount hours spent on course work can be done from your laptop, desktop, or almost any other Internet-accessing device. Pause, rewind, and replay video courses and download your text curriculum companion directly onto your device. Our flexible self-study format allows you to learn anytime, anywhere. Download your video and text and begin listening and engaging with your course material right away. You can even complete exams as many times as you’d like and print your results and certifications right at home. Online, on demand, and from anywhere-- the accessibility to your CPA CPE is the convenience and reliability thousands of licensed CPAs like you depend on! Think you’re not tech-savvy? You don’t have to be! 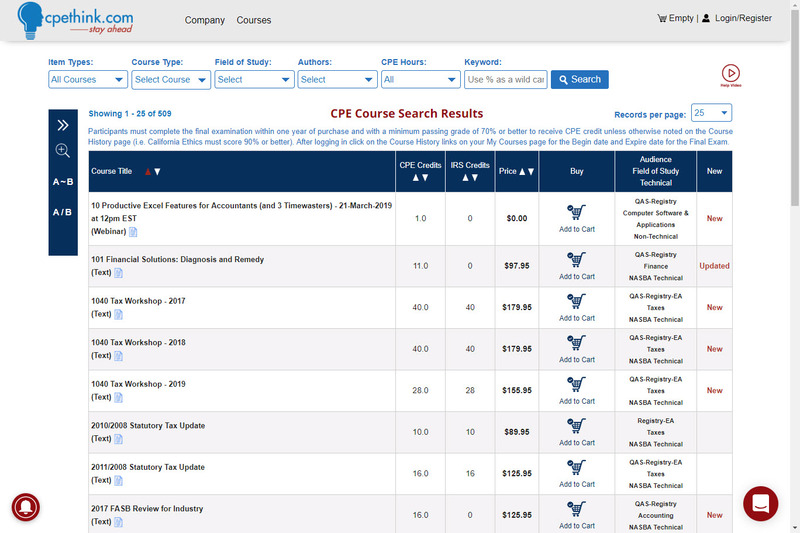 With our video tutorials and online chat, we walk you through the end-to-end process of discovering which CPE CPA courses you need, how to purchase, walk you through the course, and how to complete your examination. CPEthink.com is there every step of the way. Once you’ve selected the CPA CPE that fits your needs and timeline you can begin right away, or tomorrow, or next month. These self-study accounting courses give you the opportunity to create your own timeline and pace. Remember, you have unlimited attempts to finish with your best final exam score. You will have access to your CPA CPE courses for up to 5 years with the occasional course reminders being sent to you. We know you’re busy, that’s why CPA CPE was made easy. Purchase, test, pass and continue to flourish in your career with no more roadblocks. CPEThink CPA CPE is content and curriculum that meets or exceeds the guidelines published by NASBA, the governing body for issuing and maintaining CPE credits. Our online instructors and coursework bring you years of industry expertise with educational leaders in finance, accounting, tax, and education. Our curriculum is formatted to help you stay ahead of new rules, regulations, and best practices. Combining decades of field expertise and modern technology, our qualified CPA CPE instructors walk you through the only online resource you’ll need during the lifetime of your career. Master your core practice both technical and non-technical. Choose to achieve your requirements or go above and beyond with additional skill improvement courses. With up to 5 years of accessibility to your coursework and tests, you can achieve your desired exam score at any time. There are an unlimited amount of exam attempts so that you can get certified with a score you’re proud of. CPA professionals continue to choose us as their CPE self-study provider because they know that we provide the tools and resources that are needed to get classes that will fully meet their needs. We don’t compromise and neither should you. Upon course completion, students will receive a compilation of certificates, which can be printed multiple times in case of loss or damage after the course has been completed. We are the leading provider of CPE CPA courses. Join us, today! CPA CPE Courses are what you need each year so maintain your license with your state BoA or licensing agency. We add and update our online CPE courses every week to keep them up to date with the latest changes and it shows in the quality as well as the quantity of our material. Please check https://www.cpethink.com/cpe-reviews so you don't take my word for it. Feel free to leave a review after you have experienced the hundreds of CPE courses on our site. Purchase verified reviews are left by customers that have completed at least 1 full CPE course on our site.